Bio-healthcare is an important part of the new "SHINKA 2019" Medium Term Business Plan, and we will make a full-scale entry into precision medicine. Our goals are to reduce the burden of medical expenses and to improve the survival rate and quality of life for cancer patients. 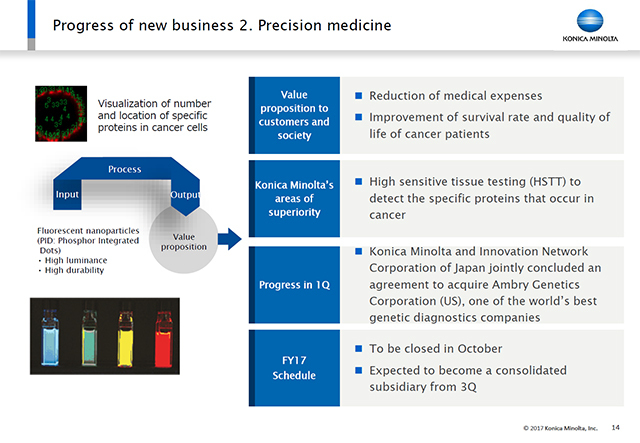 This was announced on July 6, but the Group and Innovation Network Corporation of Japan have jointly concluded an agreement to acquire US-based Ambry Genetics Corporation, a world leader in genetic diagnostics, and we are working energetically to close the deal as scheduled in October. I feel it is vital to bring this deal safely to a close in the second quarter. Ambry is currently scheduled to become a consolidated subsidiary in the third quarter.